In 2004 the Austrian-based OMV acquired in a privatization process 51% of the Romanian national oil company Petrom. Two and a half years later this privatization is again in the focus of political attention in Romania. The current government and the media consider the selling price and the royalties too low in view of the high international oil and gas prices. The whole issue of privatization is on the agenda. This paper investigates the privatization of Petrom in its historical context and deals with its consequences. In 2003-2004 the privatization of large companies was seen as a prerequisite to put an end to non-transparent subsidization, rent-seeking and favouritism in the Romanian economy. The Petrom sale was urged by the necessity to obtain from the EU Commission the 'functioning market economy status' and to close all negotiation chapters by the end of 2004. Fair and open bidding resulted in selecting the winner and setting the sales price. 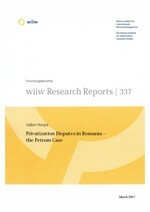 The conditions of privatization, the sales price and other stipulations of the privatization process reflected the then level of knowledge and the risks associated with a Romanian company. Meanwhile, due to high international oil prices and the improved business conditions in Romania, an EU member as of 2007, the value of the company is now certainly higher than it was two years ago – which also benefits the Romanian state as (direct and indirect) holder of 40% of Petrom's shares. It is debatable how far the recent increases in international oil prices could be foreseen in 2003, but it is quite certain that the International Energy Agency and large oil companies did not expect such a development. Still, the high oil prices benefit Petrom, and the large one-time profits finance investments. The sale of Petrom to OMV and its subsequent restructuring stabilized the company. New technologies, management techniques and organizational structures have increased efficiency. The company envisages the production decline to come to an end in 2007; explorations in Kazakhstan will add to Romania's supply in the future. As a further advantage, Petrom is the OMV subsidiary in charge of the company's business in the CIS and in Southeast Europe, Bucharest becoming the regional headquarters. The discussions around the OMV–Petrom case should have no relevance for greenfield investments in Romania, but large-scale privatizations particularly in the energy sector suffer delays. The government has stalled a number of important privatizations thus nurturing potential hotbeds of corruption.